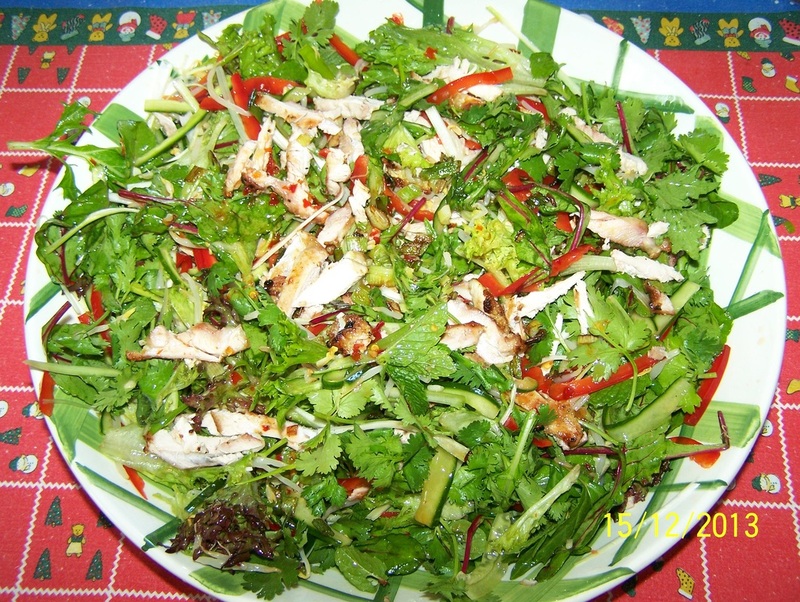 Here is another salad that is loved by all members of my family. It is a salad bursting with flavour. It is fresh and light, you feel great after you eat it. You can prepare the salad in advance, then dress it just before serving. Crispy shallots can be found in the Asian section of most supermarkets or from Asian frocers. If I can't find them, I just fry eschalots until crispy. The recipe says to use 100g salad leaves, but sometimes I add more as I feel like a lot of salad, so I say 100-200g of salad leaves for that reason. Place the chicken, garlic, lemon zest and black pepper in a snap lock bag. Massage the marinade into the chicken, place it in the refrigerator for one hour for the flavours to get into the chicken. Place the washed salad leaves in a serving platter, scatter over the julienned vegetables, give the salad a light toss. Heat a BBQ, grill plate or frying pan to medium high heat. Cook the chicken for 3-4 minutes each side, until browned and cooked through. Place the chicken on a plate, cover loosely, rest for 5 minutes. In a screw top jar, add the lemon juice, sweet chilli sauce and the fish sauce. Close and shake vigorously. Slice the chicken and lay it over the salad. Drizzle with the dressing. Scatter over the bean sprouts, coriander, mint and shallots.